The citizens of Ulster County are asking the Ulster County Legislature and County Executive Mike Hein to change its Resolution No. 431 to rip up the railroad tracks between Mile Post 10 and Mile Post 11.1. Mile Post 11.1 is the Glenford Dike, where year-round tourist trains from Kingston could give tourists a view of the Ashokan Reservoir. What should supporters do? They should call their legislators and ask them to amend Resolution No. 431 to keep the 1.1 mile of railroad track connecting the Kingston Polar Express Tracks with the Ashokan Reservoir view. Also, supporters should ask their local restaurant and hotel businesses to get behind this effort to stop the Ulster County government from forever ripping up the tracks so we can’t run year-round tourist rrains to the Ashokan Reservoir. If we don’t succeed in saving the Ashokan Reservoir Tourist Train tracks, we will be losing millions of dollars of tourist revenue. Also, our children, our visitors and future businesses will forever wonder how Ulster County could have made such a serious mistake. lvrr325 wrote: Crime on these trails is very common. The Monon Trail in Indianapolis is a crime haven, although it does run along the eastern edge of one of the worst neighborhoods in the city. In another more rural part of Indiana two girls were kidnapped and murdered from a section of a rail trail (I think ex-Milwaukee Road) that you'd never even think would be a place for a crime to occur looking on the maps. I've seen some similar stories out of North Carolina, too, the Swamp Rabbit trail. I wonder if it would be worth the effort to gather up a database of all the crimes that occur on these trails and make it known to Kingston residents? There is less crime on rail-trails than on THE ABANDONED RAILBEDS they were created from. I'm sure there is even less crime on active railroads, as long as you don't count trespass. I can find lots of stories of crime on rail trails. Nobody's jogging or biking on abandoned or very much out of service rail lines, you might get illegal dumping or kids beer parties, but there's no soft targets to rob or otherwise harm. In fact, Indianapolis has a prime example, while people get robbed on the Monon Trail, I've never seen a story about problems on the nearby ex-Nickel Plate, which until 2015 got used maybe 10 days out of the year. The CMRR rails at West Hurley and along the Glenford Dike were scrapped this past week by Ulster County. A group calling itself U&D Revitalization Corp. petitioned the STB for a ruling on the status of the track owned by Ulster County once and for all. Follow this link, it takes you to a PDF with the full filing, including supporting exhibits. CMRR cannot support this filing as it violates the gag order imposed by Ulster County as a result of the legal settlement last year. That was really interesting. I learned a lot including that the county does not extinguish the RR right-of-way, and it reads like the railroad wasn't abandoned, and that the NYC reaffirms the ROW through the reservoir. Can you abandon a railroad but continue to operate it for 25 years? And if it isn't abandoned you can't abandon it with a willing operator trying to run service and without some hearings? And if it was already abandoned, then the parcels revert to the neighboring owners. No railroad, no trail. Scorched earth. Or maybe the CMRR negotiates with the owners. Wish they had included an exhibit from CMRR refusing to comment on the filing due to the gag order. Nothing like when the government imposes gag orders. A quick little search shows that this U&D group has a Facebook page, if anyone is interested in following their progress. Last edited by Otto Vondrak on Fri Feb 23, 2018 12:40 pm, edited 1 time in total. KINGSTON — A local nonprofit has filed a petition with a federal railroad oversight board to keep Ulster County from removing railroad tracks near the Ashokan Reservoir. The group titles itself the U&D Railway Revitalization Corp. and is based in Phoenicia, it says in a press release. On Tuesday it filed a petition with the Surface Transportation Board, part of the federal Department of Transportation. In the petition, lawyers for the group ask the federal board to order a period of public comment on the county’s actions. Further, if the federal board determines the railroad line in question was not abandoned, the group wants the board to stop the county’s removal of the track. KINGSTON, N.Y. >> The U&D Railway Revitalization Corp. has filed a petition with the U.S. Surface Transportation Board that seeks to stop Ulster County from removing railroad tracks alongside the Ashokan Reservoir. In its filing, the nonprofit organization asks the federal agency to determine whether the county has the right, under federal railroad law, to remove the tracks for the creation of a recreational trail. The CMRR had its annual volunteer meeting in Kingston. Attending were myself, Harry Jameson, Pat Smalley, Peter Fluchere, Vince Guido, Art Vogel, Tom Whyte, Karin Vogel, Art Ferris, Bruce Tuchman, Jess Puccio, Harrison and George Balduf, Raphael Demeglio, Bruce Devorkin, Martin Elbrecht, Dave Heick, Dave Hilliard, Neil and Katherine Isabelle, Ernie Klopping, John Marino, Linda Marino, Marcia Roosa, Greg Peck, Fred Rasmussen, Todd Syska, Bryan Wade, Karl Wick, and Joe Wolff. Vince Guido assembled a crew that moved the section house off of its long-time home in Shokan and located it at an intermediary property until moving permits are obtained for the move to Hurley Mountain Road. Let’s hope it’s a good year for the Catskill Mountain Railroad! The nonprofit U&D Railway Revitalization Corporation had filed a petition January 16 with the U.S. Surface Transportation Board, questioning whether Ulster County had the legal authority to begin removing an 11.5-mile rail portion of the nearly 39-mile rail corridor. Rail removal began earlier in January. U&D questions whether the railroad line was formally declared abandoned along with ownership of the corridor. Now the county has filed a document with the STB, dated January 24, urging the Board to review the facts it supplied which the county says demonstrate the line at issue — the Catskill Mountain Branch, also known as the Ulster & Delaware Railroad line — has been abandoned and is not subject to the jurisdiction of the Board. The county provides documentation from 1977 showing the Catskill Mountain Branch’s abandonment. Larry Roth is U&D Railway Revitalization Corp spokesman. Interesting, the state document seems to imply notice was received approving abandonment, but that key document is missing, presumably if it exists it's in the State's hands somewhere. I'd have to read the actual sections of law the documents the county's provided cite to understand it better. Is an abandoned railroad allowed to be operated? Wasn't it still connected to the national rail system? Who regulates railroads operating over abandoned right of way? So Ulster County has been occupying private property (easements expired) for 41 years? Does NY have "adverse possession" laws like MA? Has the county stopped removing the track? Has there been a court injunction? Assuming the STB & ICC archives are complete, a final abandonment document should exist. Probably the abandonment process was halted so that they could sell it to the counties. ICC stuff doesn't seem to be online, and detail about the end of the Penn Central doesn't seem to exist online. Several years ago I was trying to find when another branch that was leased by Penn Central was discontinued, and that isn't online. 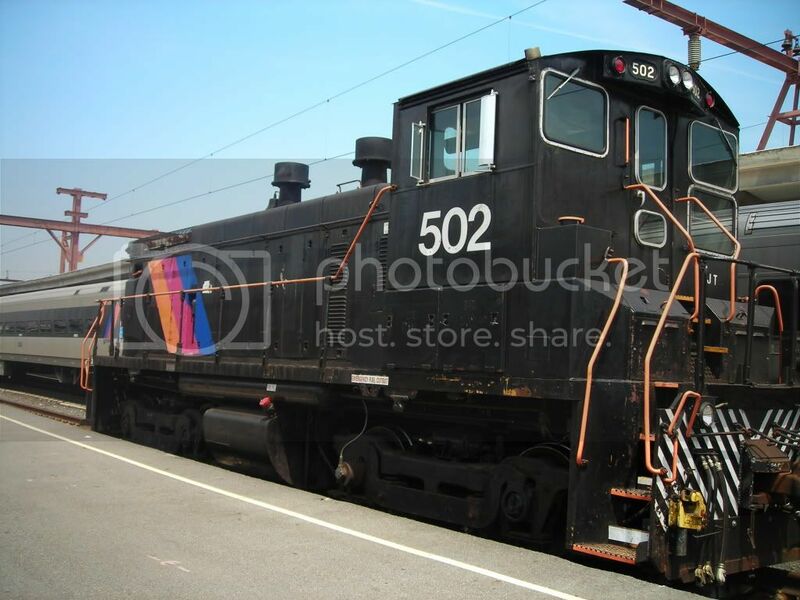 I believe it remained connected until the 1990s, without looking it up (info is in one of these threads I'm sure) and some limited freight service was run prior to Conrail removing the switch. That kind of flies in the face of the abandonment thing. Here again those sections of law probably explain the details better.